On an early morning of January 1991, a handful of car enthusiasts met at the Yorba Linda Carl's Jr. to discuss forming a club that would bring together others who also enjoyed the hobby of restoring, maintaining, and enjoying street rods and classic cars. This would not be an all-male or all-female club but an organization for families to enjoy. From its inception, the club began to grow and soon the name Classic Cruisers North Orange County was selected along with a club logo that features a 1937 Ford. Membership was open to anyone owning a pre-1958 vehicle, which was later raised to pre-1972. 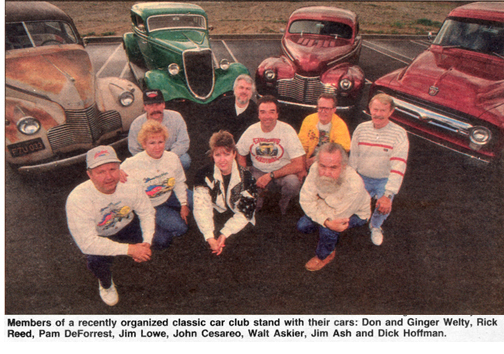 With a growing membership, our first car show, Canyon Cruise, was launched in February of 1994. This was held at Festival Shopping Center in Anaheim Hills, benefiting the Anaheim Memorial Hospital sports clinic. June 7, 2015 will mark our 22nd annual Canyon Cruise, which will be held at Canyon RV Park in Yorba Linda (formally Featherly Park). Since the 1995 show, all of our proceeds form this show, raffles etc. had been donated to Orangewood Children's Home in Orange, California, a facility for neglected and abused children. For 1995 and 1996, Featherly Park was home to our Canyon Cruise, but during reconstruction of the 91 Freeway for two years we moved to other locations. We returned to our permanent home of Featherly Park in 1999. It is a beautiful shady, relaxed, grassy area for viewing many gorgeous street rods. Throughout the year members come together to attend rod runs, barbeques, and other planned activities, such as visiting car museums and also non-car related attractions. The purpose of this organization is to bring together automotive enthusiasts who own a pre-1972 rod, custom, or classic car with an interest in preserving this hobby and socializing with like-minded classic car enthusiasts. We promote friendship by attending rod runs and other club functions. We also contribute to charitable organizations.